The big picture at Nye Beach about half way up. 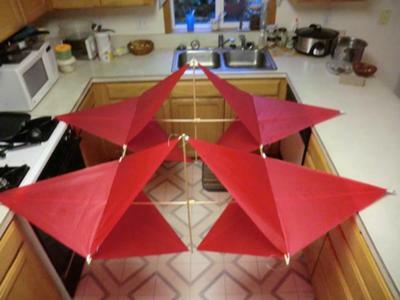 Last year, I found plans for a "Peter Lynn Box Kite." At first, I discounted it thinking it looked too complex. Still, I kept running across this design in different books until the lure of this strange, equilateral, multifaceted kite got the best of me. After successfully building and flying a Pearson Roller, I felt confident enough to build a more complex kite. 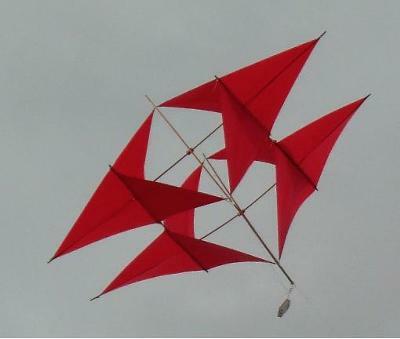 However, I was tied between the Peter Lynn Kite and the Rogallo Corner Kite. Both have advantages and disadvantages. 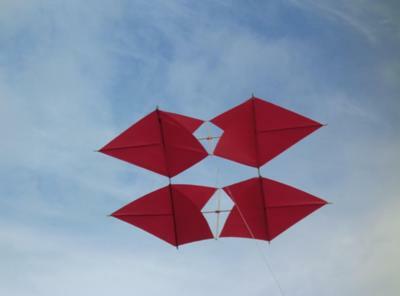 According to the book, the Corner Kite is much simpler to build but it requires more wind to stay aloft. 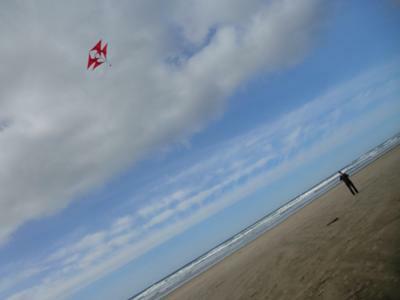 On the other hand, the Peter Lynn Box Kite or "PLT" for short is a bit more complex but is also better suited for the lighter inland breezes here in Oregon. It only needs about 8 mph to stay up. Anything over 12-15 will most likely break it hence the thicker 5/16" framework. I also wanted something that was capable of carrying a small video camera up to a few hundred feet with ease. This kite fit the bill quite nicely. Construction was of 5/16" hardwood dowel for the frame and ripstop for the sails. After some experimenting with different lines, I found that heavy gauge fishing line was a good fit for bow lines and the diagonal flying wires that I chose to add to the design. The sails took one evening to cut, 45 minutes to get them to match, and another three hours to sew them straight (by manually turning my machine) because the tension on my ancient machine got real finicky and jammed every ten stitches on me. Problematic as it was, I still finished it in about 8 hours. The first time out was a good trip with 10-12 mph winds and some pretty high gusts. It flew good, but had a tendency to lean to the left due to a loose sail. Even so it was very stable at two hundred feet coping with a large wind range as well. The second time out was at Nye Beach in Newport, Oregon. I wanted to try lofting up a video camera this time out. Winds were at 10 mph from the NE, which was more than enough to keep the kite up with the six-ounce video camera hanging on for dear life. Unfortunately, I didn't think to mount the camera solid to the frame so it was quite dizzying to watch the video after it came back down. I did get a very picturesque video of Nye Beach along with the Yaquina Head Lighthouse. I thought it was great to see "through the eyes of the kite" for a change. I hope I can get some still shots from the video. After about four minutes, the kite landed rather abruptly breaking a homemade splice joint that I had put together. No worries, I would rather lose a splice than the whole spar, just as long as I bring some extra splices next time. There was a problem with the lateral balance since I left the camera hanging rather than mounted on the frame. It was a good outing overall... Short, but good to try something new.